Offering Professional Grade Performance at an entry level price. Si-Tex's SVS-560CF combines a compact 5" Sunlight Viewable Chartplotter with 600W Dual-Frequency Chartplotter. A built-in 52-Channel GPS Receiver, quickly and accurately locates your position and shows your vessel moving across the included Navionics Nav Plus Mapping, However, if the Navionics Plus Mapping is't enough, the SVS560 is "Dual-Fuel" capable, allowing you use of C-Map charts as well. A 600W Dual-Channel Fishfinder is built-in and allows the mariner to view depth, fish, bait and structure right on the bright color display of the SVS-560. (Transducer Required, Sold Separately) Easy to operate key functions and rotary knob let you mark up to 20,000 waypoints for your favorite locations and up to 100 routes. 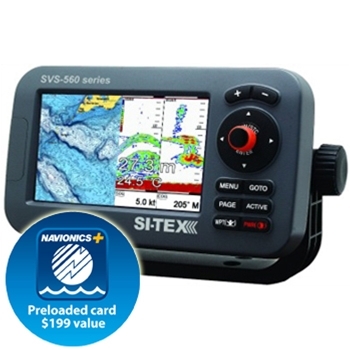 Each Sitex SVS-560CF comes with: Sitex SVS-560CF, Navionics Plus SD Card, Bracket and Knobs, Power Cable and a Two -Year Warranty.